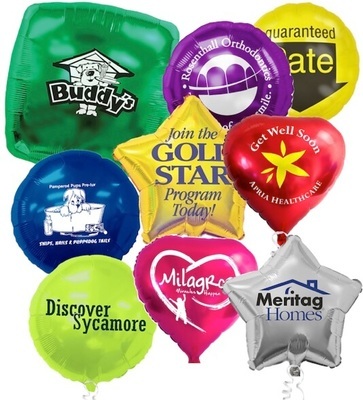 Balloons are one of the most common and visible promotional tools used. Latex balloons are the most familiar and least costly of balloon choices, but custom foil balloons should not be overlooked. Foil balloons, also known as mylar balloons are made of foil material, rather than latex, which is coated with a thin layer of plastic and metallic film. This thin layer keeps the balloons from being porous, unlike latex, and allows the helium to stay in much longer than in latex balloons. Latex balloons can only hold helium up to one day. While, foil balloons can stay afloat for one to two weeks depending on the size of the balloon and the environment they are kept in. For example, they can’t be left out in the sun because the foil does not stretch like latex and the helium when heated by the sun can cause the balloon to burst. However, because of their ability to hold helium custom mylar balloons can be set up days for your special event without worrying about them deflating. One of the most obvious advantages of foil balloons, after their longevity, is the quality of the images that can be printed on them. The smooth surface of mylar balloons allows for much more detailed and elaborate printing. As a result, your custom images or logos will look sparkling new for days on a foil balloon. Another advantage is that foil balloons can be reused. For an inexpensive option, simply insert a straw into the opening between the two slips of plastic and blow through the straw to fill the balloon back up. Or you can take the empty balloons to a store that provides helium and have them refilled. Our mylar balloons even come with a self sealing valve, which saves you so much time and energy and makes it super convenient and easy for you to fill these balloons up. Foil balloons are available in all sorts of shapes: Star-shaped, Heart-shaped, Square, and Round. They are available in myriad colors - white, gold, green, navy blue, royal blue, lime green, pink, purple, yellow, and the list goes on and on! Most of our mylars are 18" in diameter, but our square ones are 22". For those with a latex allergy, foil balloons are a safe alternative—no more parties or special occasions without the special touch balloons offer! Parties and promotions can be had without the worry of a dangerous allergic reaction! Printed Mylar Balloons may cost more than their latex "cousins," but when considering their many features that set them apart, it is easy to see that they are a valuable choice. We are ready to help you! Please contact if you have any questions. We aim to do our best to make your event or party is a great success with our sparkling foil balloons.